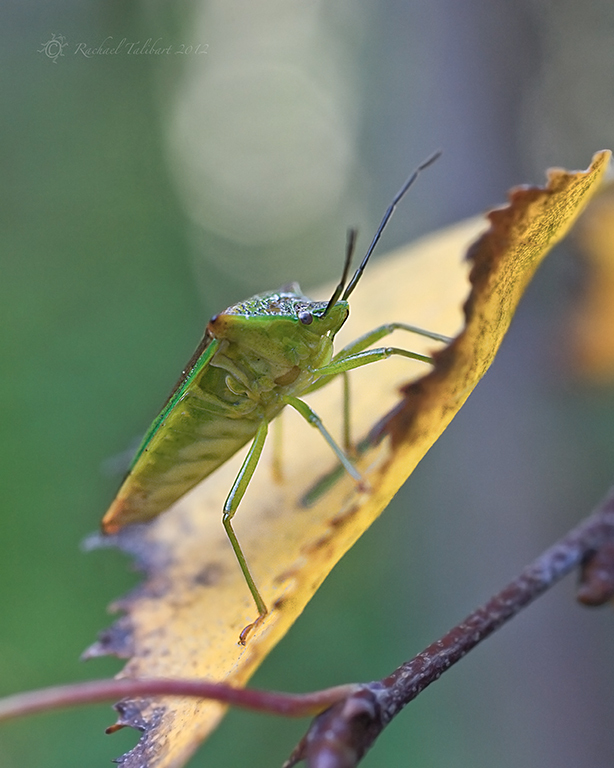 This fine fellow is a common green shield bug. 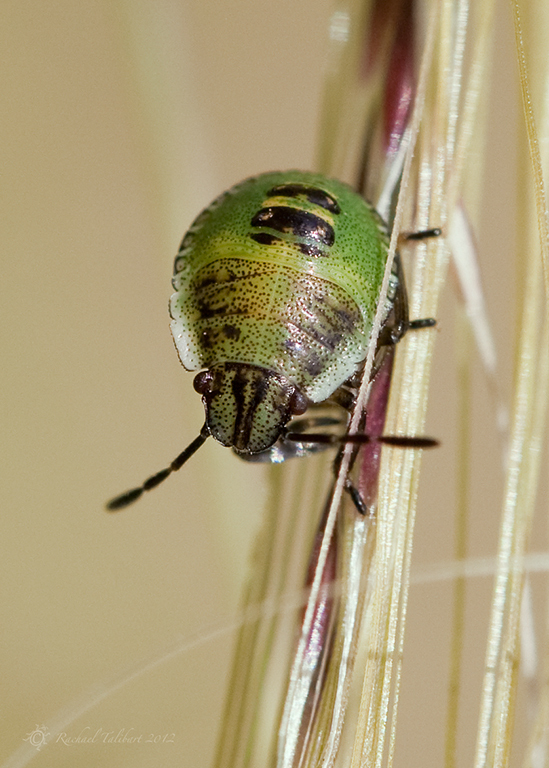 Shield bugs belong to the order hemiptera, whose members have a rostrum, or sucking beak, which they stick into plants. The common green is the most plentiful in my part of the world. There are five nymph stages. I think the little ones are really quite cute. second instar – cute or what? 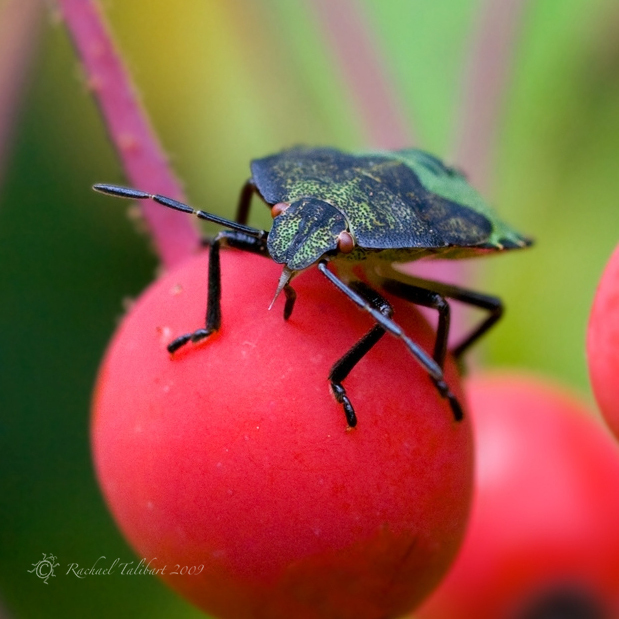 There are several other varieties of shield bug that frequent our neighbourhood. I think this next one may be a hawthorn shield bug (acanthosoma haemorrhoidale). But as green shield bugs change colour in the autumn, when this was taken, this one may just be another palomena prasina, teasing me. So that’s the natural history done, now on to the art, which is what interests me most. 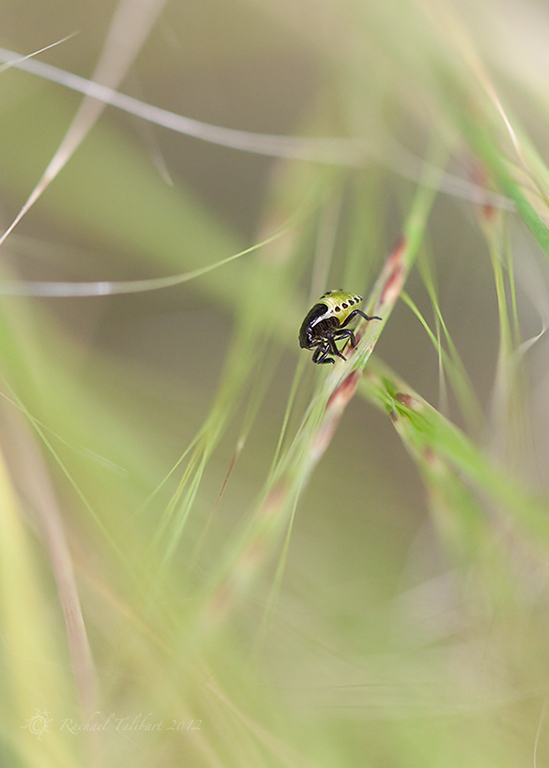 The following is another version of the second instar shot. I like this one better than the portrait crop I showed earlier. 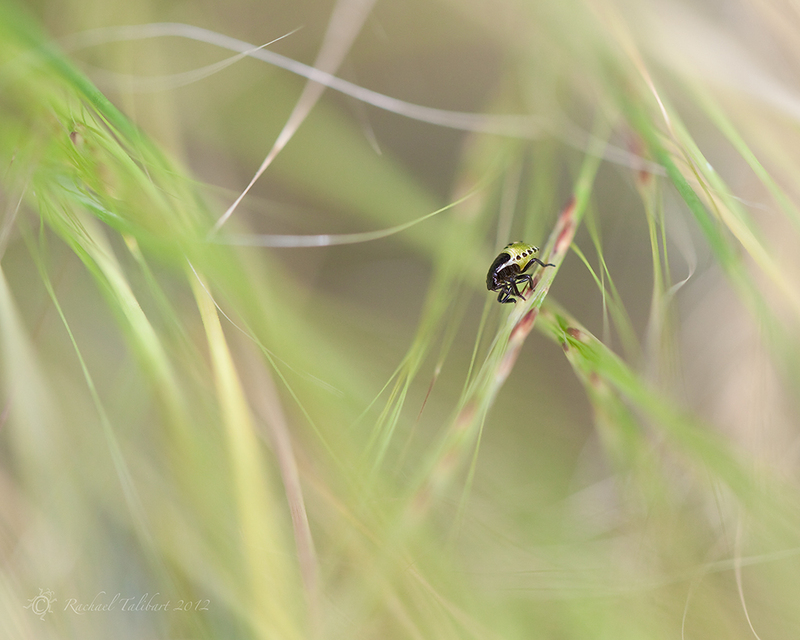 I like showing the instar as a small point within its (rather attractive in my opinion) grassy world. But a suggestion I often hear is that I crop closer with my bug shots. What do you think? All opinions very welcome. 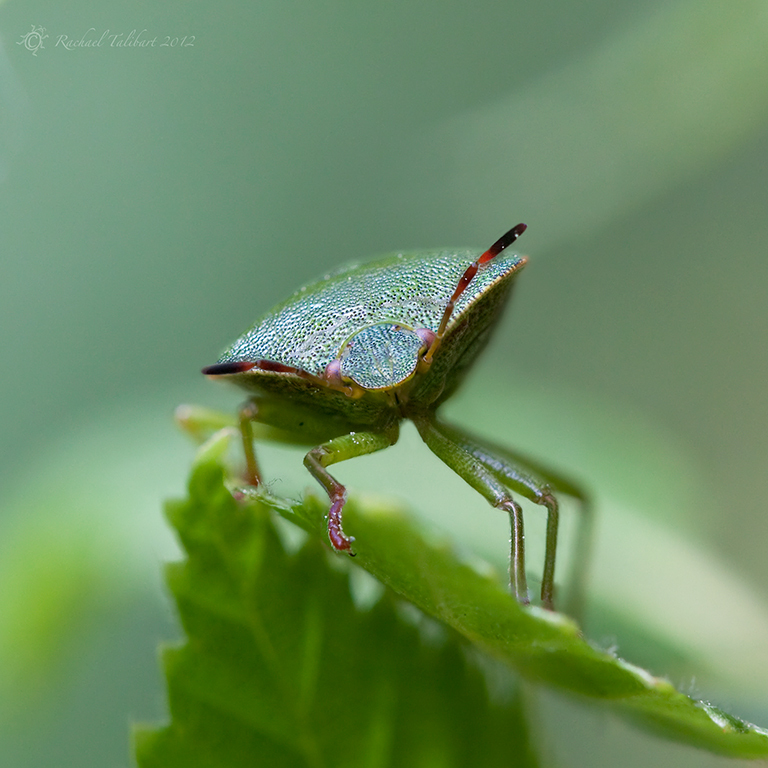 This entry was posted in garden, nature, photography and tagged garden, green shield bug, hemiptera, insect, instar, macro, nature, palomena prasina, photographs, photography by Rachael. Bookmark the permalink. Here’s another fence-ridden opinion: both styles have much merit (especially when from your camera! ), so what you’ve done here – showing both – is my preference. Fabulous, fabulous pictures. I agree with the two previous comments. The spring adult sure looks MEAN, though! I wouldn’t want him sticking his rostrum in me! I’d definitely go for an instar’s world as it is not only a good photograph but you’ve managed to tell a story and ignite the imagination. The close-ups are amazing and interesting but focalised on the subject. I liked the natural history too! I’ve never noticed the instars. Thanks. I do prefer the wider shots on the whole, but I am so often told to crop close that sometimes I begin to doubt myself! I’m gonna have to fence-sit like the other commenters here. I like a mix. And I think a little more artistry is possible when you locate the critter in its environment. Glad you posted that link. I have commented there. Super bugs!